Records, sources & information about the Parish of Inveresk & the Burgh of Musselburgh, "The Honest Toun", "Conchipolis"
This page lists some of the available sources of information about Musselburgh and Inveresk, mostly before 1900, and in particular, records that are held in the National Records of Scotland in Edinburgh, where many of the records are open to the public at no charge. Indexes and actual records for the Old Parish Registers, Statutory Registers of Births, Marriages & Deaths and Censuses are available online, following registration and the purchase of credits, at the official web-site, ScotlandsPeople. The statutory records of births can be seen at that site from 1855 up to 100 years ago; of marriages, from 1855 up to 75 years ago; for deaths, from 1855 up to 50 years ago. More recent records can be ordered. The Old Parish Registers of births/baptisms, marriages and deaths/burials (1606-1854), the Statutory Registers of Births, Marriages and Deaths beginning on 1 Jan 1855 and the census records for the parish for the years 1841, 1851, 1861, 1871, 1881, 1891 and 1901 may also be seen, in person, in Edinburgh, at the ScotlandsPeople Centre. See details at the website for the ScotlandsPeople Centre. The Old Parish Registers and census records are also widely available in libraries on microfilm. Microfiche indexes to the pre-1855 registers of baptisms/births and marriages (for all Midlothian) and of the censuses of 1881 and 1891 are also widely available. The parish of Inveresk lies within the area covered by the Lothians Family History Society. Note that although the parish of Inveresk lies within the county of Midlothian for historical purposes, since 1974 it has been within the area administered by East Lothian Council. So information about the area's history - archives, local history collections and museum collections - is to be found in Haddington, at the new John Gray Centre. Some relevant material is held at Midlothian Local Studies and Archives, Clerk Street, Loanhead, Midlothian. Note There are places called `Newbigging' in many parts of Scotland. In particular, in addition to the Newbigging in the parish of Inveresk, there is (or, rather, was) a Newbigging in the parish of St Cuthberts, at Lochrin. Local Reports of the Commissioners, 1835: Musselburgh - "... is of very ancient foundation." Previous Ridings, roughly every 21 years, had been held in 1682, 1711, 1732, 1750, 1790, 1809, 1830, 1852, 1873, 1893, 1919 [instead of 1914], 1935, 1956, 1974 [instead of 1977]. East Lothian 1945-2000, vol. 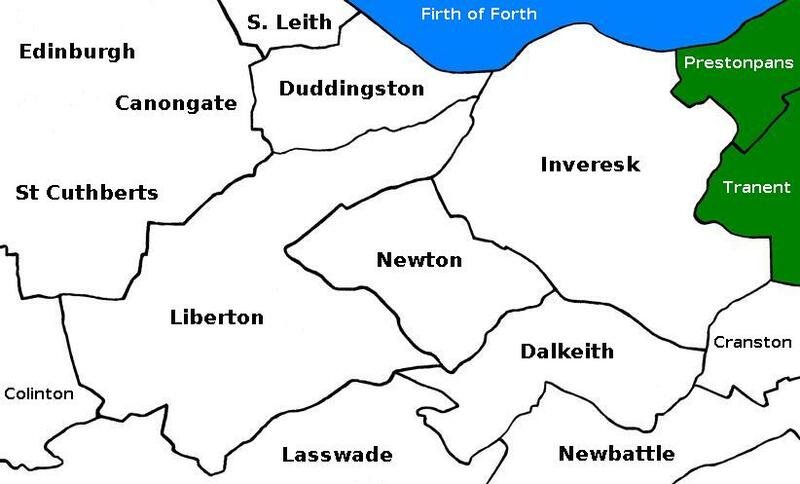 5, covering the parishes of Inveresk (with Musselburgh), Prestonpans, Tranent (with Cockenzie & Port Seton), ed. by Sonia Baker (East Lothian Library Services, 2007: ISBN 9781897857359) - see more info. For the full range of maps of Inveresk and Musselburgh in the National Library, see National Library's Maps. There are no Ordnance Survey maps before the 1850s. A Plan of Edinburgh and Places adjacent by John Laurie, Geographer, 1766. (Includes the parish of Inveresk). A reproduction of the plan was published in 1992 by Historical Discovery, 9/11 Market St., Crewe, Cheshire CW1 2EW, England - ISBN 1 85796 509 4). Ordnance Survey 1:2500 scale map (Edinburghshire sheet 4.11), surveyed 1893, published 1895 (reproduced in 1987 as Musselburgh at scale of ca. 1:4340 or 15 inches to the mile by Alan Godfrey. Ordnance Survey maps of Fisherrow and Musselburgh at 1:2500 for 1853, and 1:500 for 1893, among others, are held on microfiche at the John Gray Centre, Haddington. Dedicated to St Michael, the church is located in Inveresk village, outwith the burgh, at national grid ref. NT344721, at the site of a Roman fort. The present church was opened in 1806, to replace the previous small church, which could no longer accommodate the growing congregation. The old church incorporated materials of Roman date. It was 102 feet by 24 feet internally, with 2 aisles added on each side. These aisles were built by individuals for their family burials after burials within churches were banned in 1590; from the extant burial records, they were the Carberrie aisle, Stoneyhill aisle, Whitehill aisle and Mr Cout's (Colt's) aisle. Architectural details are given at British listed buildings. Leslie Moodie 1806-1840 b. 29 Dec 1766, son of Roger M., min. of Monimail FIF; ord. Newton 25 Mar 1796; tr. to Kelso ROX 14 Aug 1800; tr. & adm. 27 Jun 1806; D.D. 1820 St Andrews; d. 27 Jul 1840; mar. 1818 Cath., dau. of Charles Fergusson, London & gdau. of sir James F. of Kilkerran bart. James Sharp 1888-1905 b. 1 Nov 1860 Scone, son of Wm S.; assistant N. Leith; ord. N. Church, Stirling 3 Feb 1887; tr. & adm. 4 Sep 1888; d. 18 Oct 1905; mar. 1887 Annie Taylor, dau. of John Graham; issue: Wm S., Agnes M., James E., Ursula E., Maud M., Dora C., Irene S.
Archibald Gracie - d. 20 Oct 1828 Portobello, mar. Thomas Young, BM, tanner, was appointed English Schoolmaster in 1720 & Session Clerk Depute in 1740. He figures prominently as a baptismal witness from then until his death on 18 May 1756. Northesk Church was opened in 1838 and the quoad sacra parish of Northesk dates from 1859. Henry Moncrieff Macgill 1865-1906 b. 22 Dec 1835 Glasgow; ord. 6 Jul 1865; d. 7 Jun 1906; mar. 1866 Jane S. Whyte; issue: Henry, Cath., Stephenson [son], Jane W.
The Burgher chapel, built ca 1768, was in Bridge Street, west of the River Esk. George F. Dewar 1876-1881 b. ca. 1842 Carluke LKS; ord. 24 Jul 1876, loosed 4 Oct 1881, tr. to Strathaven LKS; mar. 1866 Margaret, dau. of William Wardrop; issue: Peter, Agnes, Lilias, Wm. Maggie, Jane, Geo. The Relief kirk, built 1783, was on the south side of Millhill, towards the west end. The building is now St Andrews Church of Scotland. Martin Wilson Livingstone 1837-1853 b. ca. 1808 Kilsyth STI; ord. 26 Apr 1837, loosed 12 Apr 1853, emigrated to Canada; mar. 1837 Margaret Thomson; issue: Robert; Mary A.; Wm; Margaret; Martin W.; Jane T.
David Gilchrist 1886- ord. 8 Jul 1886? The Congregational Chapel is on the north side of Fisherrow High Street, east of its junction with Bridge Street. Until 1785, episcopalians met in Sharp's Land (now 8 Pinkie Road). An Episcopal chapel was built in 1785 on the north side of Millhill, towards its east end. The congregation later moved to the present church (St Peter's, by Paterson & Shiells, Edr) on the south side of Musselburgh High Street, at the East Port, the old chapel becoming a school. Testament (Edr) 18.7.1793: "late episcopal minister at Mh"
Thomas Langhorne suc. & son-in-law to Wm Smith; b. ca. 1798 England; mar. 1822 Elizabeth Rowand Smith; issue: Thomas, headmaster of Loretto School; Wm H., teacher, Loretto; Alex., teacher, Loretto; Chas James; Cath. S.
These are online at ScotlandsPeople. They can also be seen in person at the ScotlandsPeople Centre in Edinburgh - see details at ScotlandsPeople Centre. They are also widely available on microfilm in libraries and Family History Societies. Microfiche indexes (for all Midlothian) of the baptisms/births and banns/marriages in these registers are also widely available in libraries and Family History Societies. I will provide full details of individual entries in the Inveresk marriage register, Aug 1719 to Oct 1750 free, on request. I will provide full details of individual entries in the Inveresk burial register, 1750 to Aug 1763 free, on request. Inveresk churchyard contains memorials dating from about 1700. There are stones with dates as recent as 1957. Monumental inscriptions in the kirkyard that were extant 100 years before that, in 1857, are in the Appendix of Paterson's book and a transcript of these inscriptions is at Monumental inscriptions in Inveresk Churchyard extant in 1857. It seems probable that many monuments were moved, lost or destroyed during the building of the present church. All known inscriptions in the kirkyard are in R. Torrance (ed. ), North-East Midlothian Monumental Inscriptions, Scottish Genealogy Soc., Edinburgh, 2000, ISBN 0-901061-88-3. It would have been nice to have been able to report that this was an accurate record (e.g. William Aitchison of Drummore b. 1753, d. 1939). The editing is woefully inadequate. Parts of some inscriptions are in square brackets, but no explanation is offered for that. We are told that some stones have been renewed and have less detail than the originals, but we are not told which stones they are. The original transcriber (Cramer) is said to have combined inscriptions from separate stones, where they appeared to relate to the same family; why is there no indication of where this has occurred, or why have the inscriptions not been separated again before publication? The dates are the earliest mentions of the stones (or railings in some cases). Some of the entries below undoubtedly refer to the same stones. A "through stone" is a horizontal stone. Date format is dd.mm.17yy. The given names "Patrick" & "Peter" were used interchangably at this time. Very few of these stones can now be identified. The modern cemetery is immediately west of Inveresk Churchyard and is being steadily expanded westwards over the site of the Roman fort. The registers of burials and burial lair plans for Inveresk Cemetery are held at the Registration Office, Brunton Hall, Musselburgh (Tel 0131 653 5225/5226). See East Lothian Council: Paying for the burial. I am not aware of any listing of the monuments in the modern cemetery. See also Monumental inscriptions in Inveresk Churchyard. Manuscript transcript available in Scottish Genealogy Society Library. Also now published as part of R. Torrance (ed. ), North-East Midlothian Monumental Inscriptions, Scottish Genealogy Soc., Edinburgh, 2000, ISBN 0-901061-88-3. Contains names of 682 heads of household and some others; wives, children and servants are mentioned but in most cases not named. See also Poll tax records and Census records. Nos 1-5 were drawn up by the kirk session to provide the names of children to be examined in their catechism, and were probably used by Dr Alexander Webster in computing the total population of Scotland in 1755. 15 Jan 1755: List of people of all ages on the east side of the water of Musselburgh (i.e. the River Esk) (NRS ref. CH2/531/55). Incomplete. 1835: Ecclesiastical census of part of the parish (NRS ref. CH2/531/59). Census records are also widely available in libraries (such as the Scottish Genealogy Society's Library and Edinburgh Central Library) on microfilm. Microfiche indexes to the censuses of 1881 and 1891 are also widely available. The 1881 census is also available on CD-ROM, but be warned that numerous inhabitants of Inveresk on the CD-ROM are incorrectly listed as having been born in "Middlesex, England" instead of "Midlothian, Scotland". Indexes to the 1841, 1851 and 1861 censuses have been published by the Lothians Family History Soc. The censuses of 1801, 1811, 1821 and 1831 do not name individuals. 579 residents listed in the Musselburgh section of the Edinburgh & Leith Post Office Directory for 1842/43 are available here (surnames A-K) and here (surnames L-Y). A search on Google for '"Edinburgh & Leith Post Office Directory" site:archive.org' will find more. Mrs Jessie B. Burns ?-1974-? Musselburgh belonged anciently to the Abbey of Dunfermline in Fife, the lands of Inveresk being part of that abbey's `Regality of Dunfermline'. An attempt in 1632 to raise its status to that of `Royal Burgh' was squashed by Edinburgh Town Council, who feared competition on their doorstep. This prevented Musselburgh from engaging in foreign trade. Until the reforms of 1833, there were 18 councillors, including two bailies (magistrates). Two councillors retired each year at Michaelmas, 29 September, & two new councillors were elected. Of the total of 18, 10 had to reside within the burgh, 6 in Fisherrow, Bridgend or Marketgate, and 2 in Newbigging, Millhill or at the salt pans. List for the years 1406-1841 is here. Located south of Musselburgh, on the River Esk, at Cowpits. This may reasonably be supposed to have been the chief mill of the shire called Musselburghshire that existed before Inveresk became the property of Dunfermline Abbey; see Prof. G.W.S. Barrow's The Kingdom of the Scots, 2nd ed., Edinburgh, 2003, p. 44 on the subject of shire mills, shire muirs, king's mills and king's muirs in the context of shires and thanes. Adjacent to one another at the West Port of Musselburgh (west end of the High Street). Occupied in 17th century by several generations of a family called Scot. Between Easter Duddingston & Fisherrow, on the Brunstane Burn, & probably originally in Liberton parish. The "New Mill of Gilbertoun, commonly called Brunstane", built on the acre known as Farthinghaugh, was in use by 1628. Farthinghaugh was the property of a family called Robertson from 1628 until 1742 or later. The site of the "Old Mill of Gilbertoun", in ruins in 1670, is unknown, though there are references to an upper & nether mill. See Paterson for a somewhat confused account. page 281: ref. to Andrew Pringle, millwright at Brunstane Mill, who claimed in 1790 to have invented a water-powered teazer, & was awarded £30 for his efforts by the Board of Trustees for Manufactures. See NRS ref. NG.1/1/27 for 10 Feb 1790 & 8 Dec 1790.
p. 466: ref. to use as woollen cloth manufactory from circa 1781, & as a skinnery by Peter Wilson 1794-1802, & for both uses 1802-1810.
p. 472: ref. to flint mill for glass or pottery upstream of Brunstane Mill, working 1812. See John Knox's Map of Lothian 1812. William Baird (Annals of Duddingston & Portobello, Edinburgh: Andrew Elliot 1898) states that John Thomson of Priorletham began a woollen factory at the mill in 1793, abandoning it a year or two later. There was a pottery at Westpans [west with respect to Prestonpans] by 1738, when a Robert Peet (or Pate) sought funds to establish himself in business. James Thomson held a tack (lease) there in 1750. Samuel Lammas held the lease from 1754. Thereafter, Anthony Hilcoat, Adam Cubie, Thomas Shelley, William Littler (in 1764), William Dallaway and William Littler - all Englishmen except Cubie - were active there. The pottery closed around 1777. There was also a pottery in Newbigging from 1800 to 1930. It was initially the property of a William Reid; ownership passed to Dr William Affleck Gray in 1889 (though he had run the pottery since 1868) and, later, his sons. Mrs Marion Richardson bought the pottery in 1926, but it was abandoned by 1930 and she sold it in 1932. Hay's map of 1824 indicates the site of barracks - "Barracks for 1000 Infantry were erected here 1803 - Demolished 1814." - on the south side of Pinkie Road, immediately east of the old railway line that led north from Pinkie Coal Work. Originally stationed at Port Seton, by Prestonpans. Moved ca 17.6.1805 to Musselburgh. Embodied 5.4.1803. In barracks at Musselburgh from 26.5.1803. Moved to Edinburgh Castle, 12.10.1806. Moved to Dalkeith, 5.6.1807. Moved back to Musselburgh, 20.5.1809 and 2 days later to Haddington. Disbanded 13.8.1814. In Musselburgh by 30.7.1803 and still there 14.10.1806 [on basis of banns listed by Davidson]. Left Musselburgh 17.6.1805 for England. Some of the militia stationed at Musselburgh were moved to guard French prisoners at Penicuik MLN after 27.4.1805. EdinPhoto: Musselburgh - old photographs of Musselburgh. Geograph.org: Inveresk - recent photographs of Inveresk. National Grid ref. NT3471. 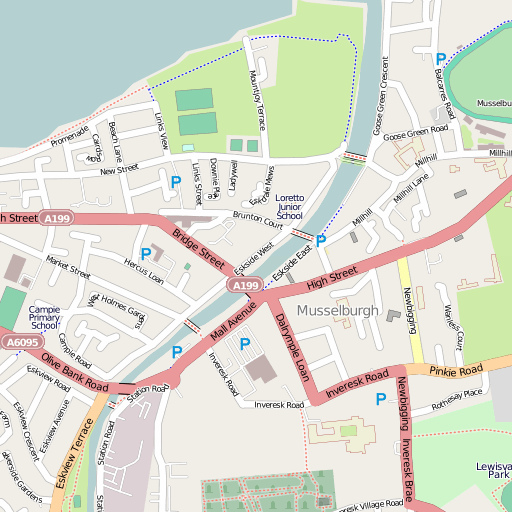 Geograph.org: Musselburgh & Fisherrow - recent photographs of Musselburgh & Fisherrow. National Grid ref. NT3472. Just a list at present. I hope to add details soon. If you know of other pre-1900 place-names and their locations, please let me know. National Records of Scotland, ref. NRS DC5. These are records for the years 1804 to 1975 for Musselburgh District Council and its predecessors, including records of the parochial board. Some details of Inveresk Combination Poorhouse, including a map and photographs of the building, are available here. The registers of sasines (changes of ownership of land) for the Sheriffdom of Edinburgh (which includes Inveresk) can be seen in person in the Historical Search Room at the National Records of Scotland, Edinburgh. Valuation rolls of properties in Inveresk, for the years 1885, 1895, 1905, 1915 and 1920 only, can be seen at ScotlandsPeople. These name owners and occupiers/tenants of properties. Indexes to all extant pre-1926 testamentary records (wills & inventories of moveable property) can be searched free of charge at ScotlandsPeople. Digital (and paper) copies of the documents can be purchased at that site. Note that hardly any of these testaments before 1800 include the will of the deceased, being largely accounts of the 'goods and gear' of the deceased and of debts owed and owing. Some of them mention relatives. An almost complete list of those for whom there are testaments and who were resident in Inveresk.